Great public galleries have a tendency to overwhelm in an a curious and inbuilt tension that pulls at odds against their purpose. The scale of the space and stone is formidable and all those cold panes of glass between paint and person or the shin high cordons that forbid us from the space around a work suggest us that, at best, we're unwelcome at worst a threat to the object itself. The tension is often most damaging to the greatest works, with all that security and all those other pictures we feel embarrassed to linger too long, lest we miss something else or fail to gaze with sufficient reverence. Well meaning galleries over-compensate by flooding the halls with themes and interpretations. It's a shame as it's just another obstacle between you and me and the painted image, those great and universal public assets that we all deserve to see. 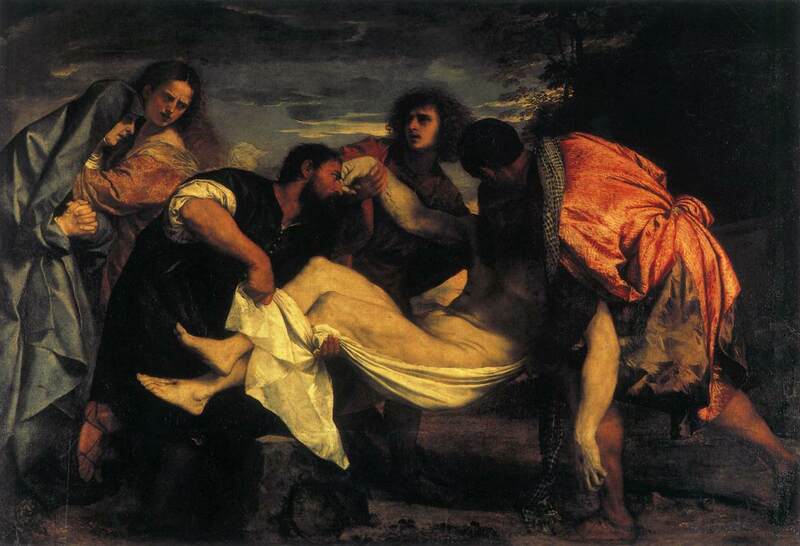 No art museum comes with a more powerful than the reformed palace of the Louvre. Anywhere that holds the exquisite secular relic and global celebrity the Mona Lisa can't help but change our relationship to the building and the other objects in it. However it might just be that the sheer disproportionate volume of Leonardo's small work makes space and time for all sorts of other works. The Mona Lisa is a magnet for clamour and clatter (to the extent that I'm not going to even pretend to have really seen it in any meaningful way) but that noise has a sweet reverberation, it let's us linger, engage and indulge in front of La Joconde's Italian neighbours. The stretch of the Louvre that shows Italian painters soar in what we now call the Renaissance has an oddly matter of fact brilliance. You walk through the high walls and wide corridors and again and again find something breathtaking. The lack of pomp for the vast majority of works is a great leveller, it makes them easier to see as paintings rather than price-tags or treasures. The comparison with what is happening in the works instructive for repeatedly we see artists take the sacred, awesome and ineffable and render it in human terms. 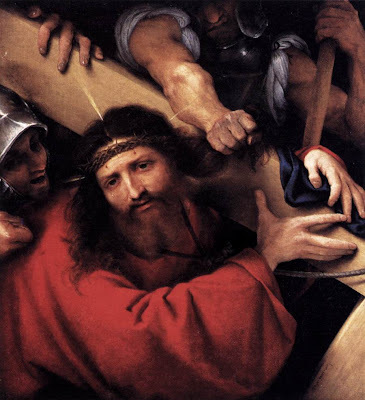 The abundance of Christian imagery, the cast of now largely obscure saints and barely half familiar situations is Christianity can be a barrier to viewers today. The sense that special knowledge is needed to interpret painting has been promoted by historians and critics, whilst mainstream Christian imagery has become simpler, focussing on a benevolent Christ figure and the idea of personal salvation. 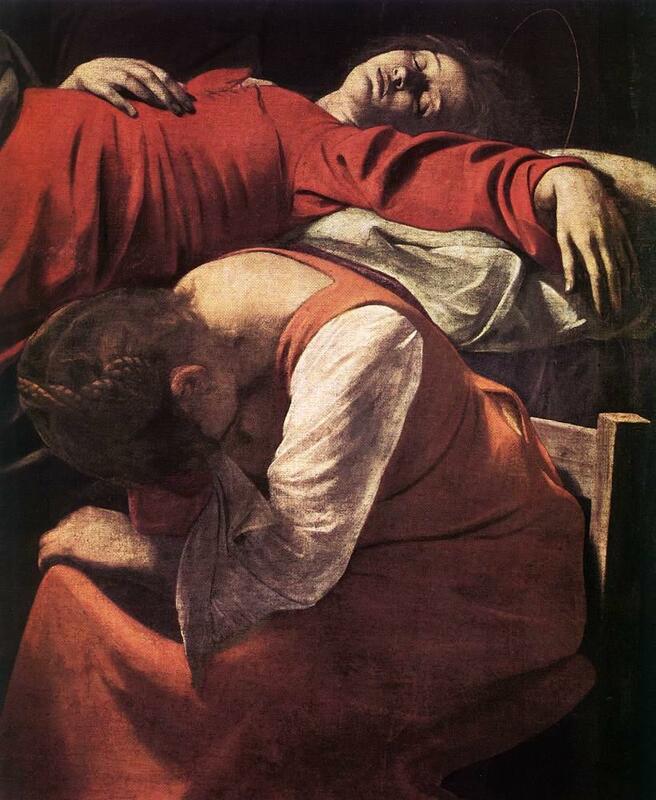 Italian painting of the fifteenth and sixteenth belies this. There is a breadth of situation, character and imagery but the efforts of the artists to couch these in universal, if often extreme, experience makes access easy. It's just a question of looking. 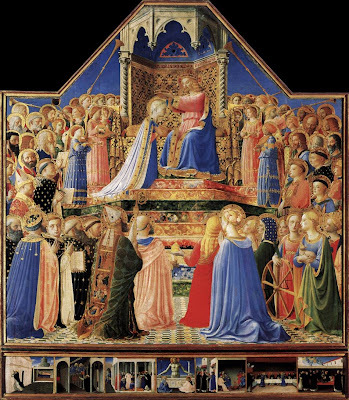 Fra Angelico's massive altarpiece, 'The Coronation of The Virgin' is awash in gold and blue. 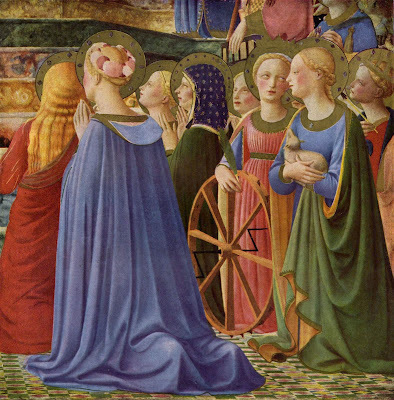 The stepped construction, building up to Mary crowned by Christ, brings the eye upward but the first step brings us on to a familiar scene. A crowd is assembled, ostensibly made up of Saints, to bear witness to the coronation. On the bottom right two women (St Catherine with the wheel on which she is broken and St Agnes with her eponymous lamb) look on. More accurately the two women seem to share a confidence or remark on the scene. Whichever is the case it doesn't matter, in that small gesture Fran Angelico opens up the work to us, in giving two characters such an understated and quiet moment he has changed the scene. The moment of veneration is linked to private quiet contemplation and as that happens the scale shifts to one we can understand. 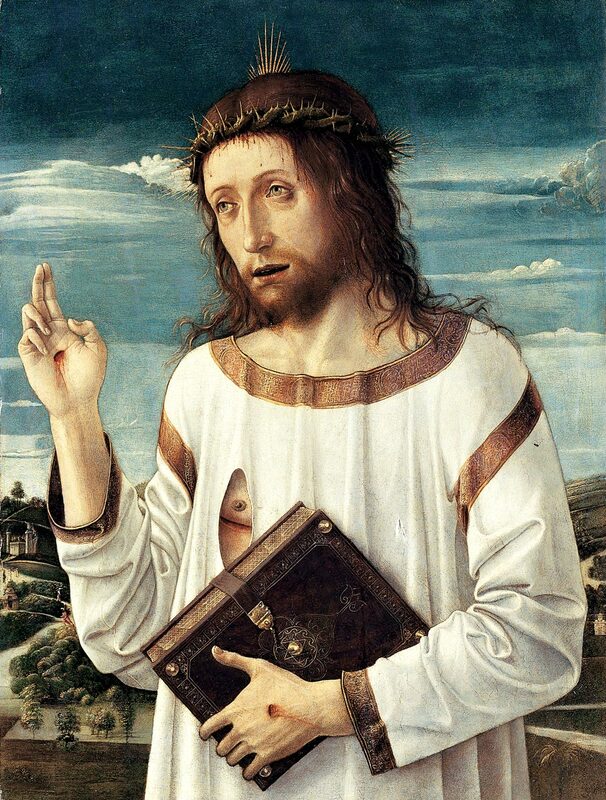 An innate quality of Christianity is the way, primarily using the figure of Christ, it negotiates the metaphysical questions that nag at sentient humans. Where art is at its best it considers, or aids in the consideration of similar questions: what it is to be conscious, how we can understand others or how we face our own mortality. Christianity does this through analogy even if we strip it of supernatural content. Art still looks for those analogies in colour and form but it is during the Renaissance when, in the service of Catholic patrons, artists attempted to evoke empathy through pictorial realism to explore those questions more directly. This evocative and empathetic approach is not necessarily the same as outright pictorial realism, even though many images from the period are uncannily photographic, but it does seek to create recognisable images that are more than totems. It lets us look at fiction and see ourselves. Andrea Mantegna painted figures in sometimes strained perspectives that don't always work on paper or screen. His figures get described as 'sculptural' but of that's the case it's a rough and wise marble that forms such recognisably human figures. Standing below 'Saint Sebastian' it makes perfect sense, it's sculptural because a man is tied to the ruins of classical column. There are two faces that make all the points you need. Arrow pierced Sebastian looks to the sky, whilst his torso is classically perfect his lips are thin, pained and his eyes scared. That look is not just one of beatific resignation but it stumbles too with doubt and hopelessness. 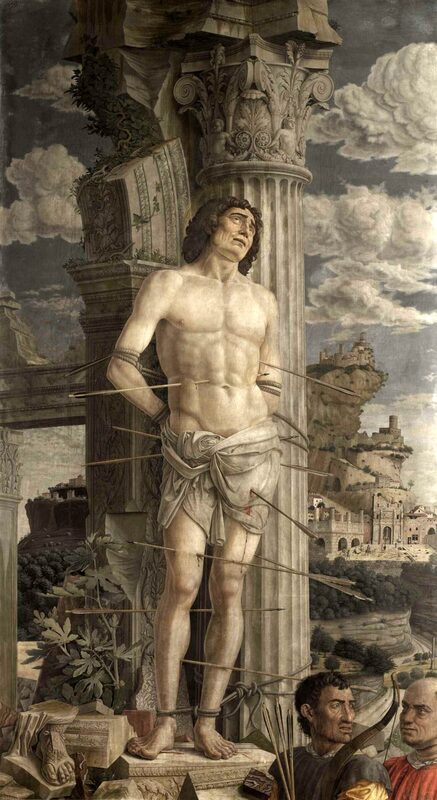 Look down again, to our level and the tanned and leathery archer feels fear too, confusion and disbelief make him turn and look for affirmation, for anything. The archer figure helps make us complicit and his confusion lifts him above a pantomime villain. This Sebastian can pulse with meaning for us because it isn't about the superhuman it's about the all too fallible. 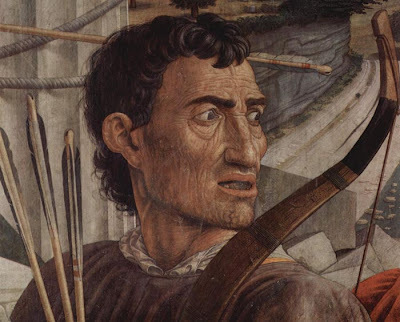 Doubt and fear capture us and Mantegna meticulously captures the familiar shock of unknowing. 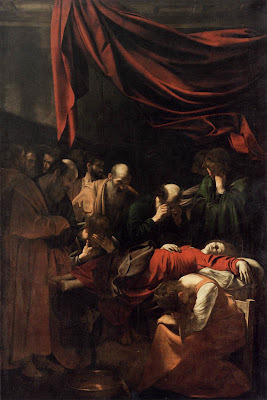 'The Death of the Virgin' has less of the wizened muscular Roman lowlifes that make Caravaggio look like modern moody social realism but instead it creates a very intimate theatre. It's tall, and when you look up you realise that virtually nothing happens in almost the whol top half. Instead of action there is a blackness and the scarlet folds of a curtain, draped and hanging as a canopy over the scene below. Beneath this coagulated sky a study in the shapes and shades of bloody grief plays out around a stone white corpse in a red dress. Mary lies lifeless and next to her the Magdalen is folded and almost limp with grief. The static paint almost twitches with loss but without histrionics. The faceless figure in the corner provides an actor for us to cast as ourselves, without the mugging of the other characters it's easier for us to imagine the confused ache of grieving. That's perhaps when we look up again, and the swirl of red fabric feels like inchoate rage at the sudden absence of a life. There might be a creative tension at work throughout the Renaissance, that between a supernatural God and the growing cult of the individual. Another way to look at it is that understanding the role of religion in helping us give form and substance to our own existential crises. This isn't a religion of assured personal salvation but simply one of people reaching out to one another through pigment in the dark and finding the empathic power of art. 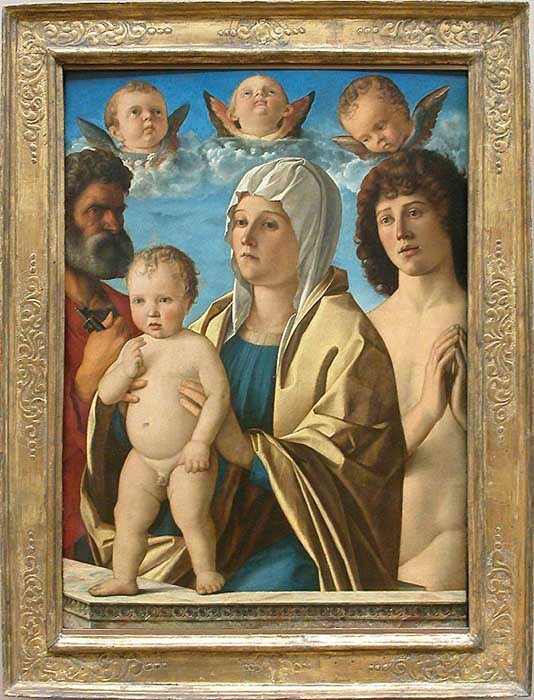 That's not to say that the work here is automatically transcendent or improving, but when we see the hesitance in the face of Bellini's virgin as she realises her son is bound for death we have the opportunity to reach out for others too. Whether mirrors or lenses the great works here are all full of doubt and frailty and fallibility and nothing could be more human. I actually had someone come out a couple weeks ago to give a bid for a checkerboard kitchen floor...so classic!